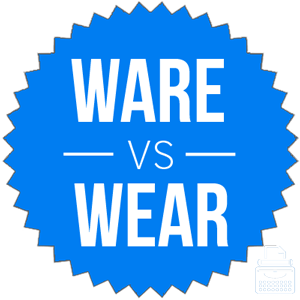 Ware or Wear – What’s the Difference? Home » Ware or Wear – What’s the Difference? If you are shopping for a new cake pan because you left your old one at a gathering and can’t get it back, should you be looking for housewares or housewears? Wear and ware are homophones, which means that they are pronounced alike even though they have different meanings. Their pronunciations cause confusion for certain writers, but the differences in meaning between these words are such that they can never be substituted for each other. What is the Difference Between Ware and Wear? In this post, I will compare wear vs ware. I will use each word in at least one example sentence, so you can see it in context. Plus, I will show you a helpful memory tool that you can use to help you choose either ware or wear in your next piece of writing. What does ware mean? Ware is a noun. Ware refers to goods or material. Its plural is wares. Ware forms part of many compound words, like warehouse, a place for storing things, and housewares, a word for goods used around the home. “Show me your wares,” said the trader to the merchant. “Our wares are only the finest quality, for those distinguished buyers who need the very best,” said the salesman. What does wear mean? Wear is a word with many meanings. Sometimes, it is a noun that means clothing or garments. It is part of several compound words, like outerwear, which is clothing worn as the outermost layer of an outfit. Usually, though, wear is a verb. Sometimes it means to clothe oneself with something. A person might wear a shirt and pants to work, or a dress. The same person might wear a different outfit to the gym after work. Tradition dictates that you should never wear white to a wedding unless you are the bride. Rebeca wears each dress only one time before throwing it in the trash and buying more. Other times, wear means to tire or to degrade, like in the phrase to wear out. A person might wear out after running the first few miles of a marathon, and not be able to finish. Likewise, the bearings of a machine might wear out and cause the machine to malfunction. Instead of throwing away worn out kitchen towels, Bryan uses them for rags in the garage. “You’re going to wear me out!” Aubrey told her personal trainer after a few minutes of the workout. Wear is seldom used as a noun, except in compound words like outerwear and underwear. Therefore, if the word you are using is a noun, you probably need ware. Wear, meanwhile, is a verb, so if a verb is what you need, wear is the best choice. Ware vs. Wear Check: Since both wear and verb have an E as their second letter, it should be easy to remember that wear is a verb. Is it ware or wear? These words are not interchangeable, so choose carefully between them. Ware is a noun that refers to goods and materials. Wear is a verb that means to don clothing or to tire or degrade. 1 What is the Difference Between Ware and Wear? Widow vs. Widower – What’s the Difference?